Saturday's demo at Daytona Beach, Florida had three RS Aeros out on the water, two owners and one demo boat. Halifax Sailing Association played host and with the wind increasing well above forecast the demo-ers had a ball in the lovely conditions on their protected Intracoastal Waterway. 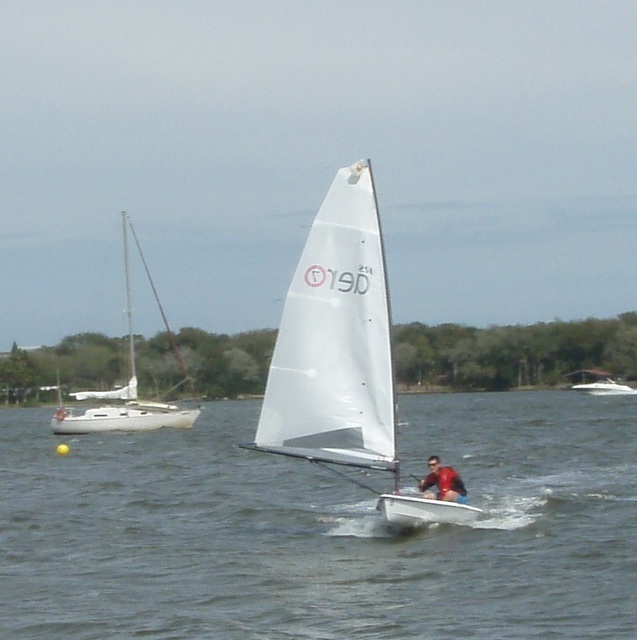 ‘We had a nice turnout and a lot of fun with a steady stream of demo sailors on the RS Aero 7 graciously provided by Masthead Enterprises and Sandy Point Sports, and an Aero owner who drove in from Gainesville sailing his Aero 9 along with me on my new Aero 9. It was practice day for the youngsters at Halifax Youth Sailing so we were weaving through the Optis and 420s as they were going through their drills. Sandy Point Progressive Sports is the new RS Dealer on the East Coast of Florida and was present together with Masthead Enterprises from the West Coast. They are both looking forward to continuing to build the RS Aero fleet across the Southeast with the boat being well received by those who try her.